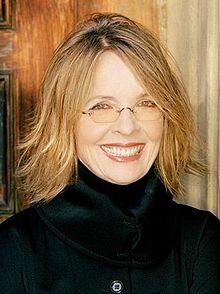 Diane Keaton (born Diane Hall; Januar 5, 1946) is an American film actress, director, producer an screenwriter. She began her career on stage an made her screen debut in 1970. Her first major film role wis as Kay Adams-Corleone in The Godfather (1972), but the films that shaped her early career war those wi director an co-starn Woody Allen, beginnin wi Play It Again, Sam in 1972. Her next twa films wi Allen, Sleeper (1973) an Love and Death (1975), established her as a comic actor. Her fowert, Annie Hall (1977), won her the Academy Awaird for Best Actress.